A mentally disturbed son of privilege who enlisted his cousin in ambushing and killing four young men, burning bodies, crushing one with a backhoe and burying them on his family's suburban Philadelphia farm, pleaded guilty Wednesday to murder charges that will put him behind bars for life. 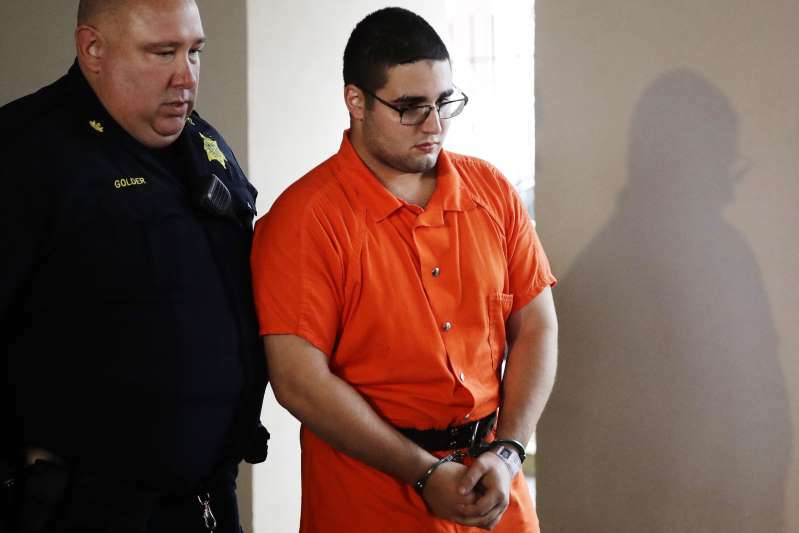 Cosmo DiNardo's plea, which was all but certain after he confessed last summer in exchange for avoiding the death penalty, gave solace to a grieving father who turned to the stone-faced 21-year-old killer and told him: "Your only way out of prison is wearing a toe tag." "That's the least we all deserve," said Mark Potash, the father of 22-year-old victim, Mark Sturgis. Melissa Fratanduono, the mother of 21-year-old victim Tom Meo, cursed at DiNardo, saying it has "taken everything" for her not to kill him herself. DiNardo has a history of mental illness, including an involuntary commitment and a schizophrenia diagnosis, but his lawyer said mental health professionals weren't sure they could have presented an insanity defense. "Mental illness is real, mental illness is sad, and sometimes it can be tragic," lawyer Fortunato Perri said. DiNardo's cousin, 21-year-old Sean Kratz, is expected to plead guilty to charges related to his involvement in the deaths of the men. DiNardo, the scion of a wealthy family, dabbled in dealing marijuana and customizing sneakers and portrayed himself on social media as "a savage." He showed himself holding guns and would send aggressive messages to women he found attractive. Authorities saw him as the mastermind of the killings and charged him in all four deaths. Kratz was charged in three. Potash called DiNardo a "perfect example of someone who started at the top and worked your way down to the gutter." "You think you're savage?" Potash said. "You've lived your whole life protected. In prison, you'll meet savage. And I promise you, it won't look like you." Police found the men after a five-day search. Three were lit on fire and placed 12-feet (3-meters) deep in an oil tank converted into a pig roaster. DiNardo allegedly lured them to his family's farm under the guise of making pot deals. DiNardo quickly confessed, and District Attorney Matthew Weintraub said authorities might never have found 19-year-old Jimi Taro Patrick's body unless DiNardo told them where it was. Patrick's grandparents, who raised him since birth, asked DiNardo to pray for them and for his mother, who she says is mentally ill, so that someday they might be able to forgive him. "My heart is broken, and I will never, ever be the same," Sharon Patrick said. DiNardo was expressionless as he pleaded guilty to charges including first-degree murder, conspiracy, robbery and abuse of a corpse. "If there is anything I could do to take it back, I would," said DiNardo. "I cannot come to terms with what occurred. I'm so sorry." Judge Jeffrey Finley dismissed that as "false and insincere." "To you, human lives are disposable," Finley told DiNardo. "They have no value." The families of the slain men are suing DiNardo's parents, Antonio and Sandra DiNardo, who own the Solebury farm property and construction and concrete companies in Bensalem, where they live. The families say DiNardo's parents shouldn't have allowed him access to a gun, which was barred by law due to his commitment. In his confession, DiNardo acknowledged selling handguns to local residents. Five months before the killings, police charged him with having a shotgun. "My family received a life sentence," Anthony Finocchiaro, the father of 19-year-old victim Dean Finocchiaro, told DiNardo. "I pray that Dean's spirit haunts you the rest of your miserable life."